Hydroponics is the ability to grow plants without the need for soil. When people think about hydroponic weed, they imagine the plants with roots being suspended in water without the use of any growing medium. 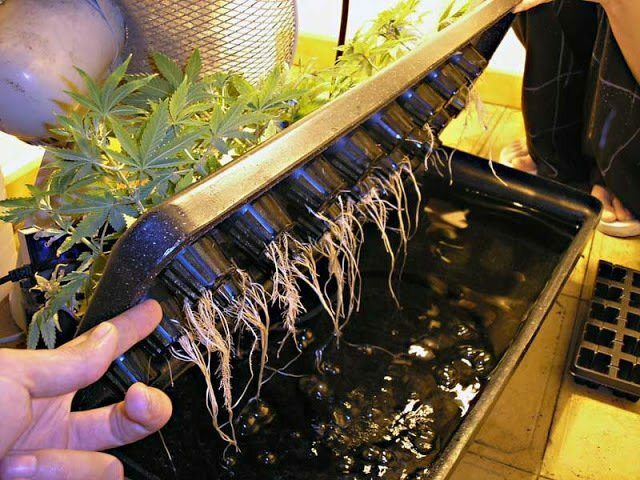 Although this is one method, it is not the only way to grow your weed hydroponically. Today there are many variations to growing the weed without soil, all with their own unique advantages for the grower. When you can get the nutrients right to the roots without the plant having to seek out and extract them on their own, the plant is left to blossom and flourish more easily, using their energy to growing more potent buds faster than you ever though possible. Depending on your set-up, the hydroponic weed process can either be very simplistic or extremely complicated, similar to grow tents. Before we discuss the different hydroponic weed systems, we need to fully understand all the advantages of growing weed in this particular manner. The biggest advantage to growing hydroponic weed is you will get the highest potential yield of crops than any other method. Basically, you are maximizing the growth potential of the marijuana plant by utilizing only water, and while it may appear strange to grow your weed without soil, the yield will be unlike any you have every had. With hydroponic weed, you are in complete control of the nutrients that go into your plants, unlike when the roots are in the soil and must find the nutrients on their own. Basically, you only need to provide the plants just enough substrate so the plant remains upright. With the open nature of this unique root system, oxygen and nutrients are easily circulated, further improving the efficiency of your plants. This means certain aspects of the hydroponic process are easier than growing your marijuana plants in soil, it will be easier to check on nutrient levels, hydration levels, and health of the plant too. The hydroponic process offers the highest potential yield when the entire growing process is followed correctly. For most growers, this is the be-all and the end-all to making the decision for them. Marijuana grows the fastest in the hydroponics system and it is easier to keep that growing environment clear of insects, parasites, insects, or bacteria. If you have to look at a downside to the hydroponic weed process, that would be only the costs involved to get your system up and running. That being said, once the system is up and running, you will make back your initial investment in explosive yields. Although you save on the cost of soil, you will need another substrate to allow the weed to blossom. These substrates range from vermiculite, clay pellets, coconut fiber, rockwool, or perlite. Each has the ability to allow the roots to get more nutrients with less effort. With so many different choices when it comes to the hydroponic weed systems, we are going to tackle the top three systems to give you an idea what is available to you. Each of these growing systems work on a very similar premise, by feeding nutrients to your marijuana plants through specially designed hydroponic systems. When done correctly, you’re creating the ideal growing environment for your marijuana plants and will eventually result in a substantially higher growth rate and yield than by placing the plants in best soil to grow. Before you choose one of these systems or perhaps another hydroponic weed system, it is important to note that there really is not any wrong growing system. None of these systems are going to damage your marijuana plants, and each one has the potential to outperform the other. Not only are these hydroponic systems very simple to set up and operate, even if the nutrients are drained away, it is very unlikely your plants will be overfed. These green buckets all aligned in perfect rows look like a miniature version of a full-scale growing operation. The equipment that makes up this hydroponic weed system is highly functional and does a great job growing marijuana. At the center of the system is a 55-gallon reservoir which needs minimal maintenance, allowing you to go away for extended periods of time feeling confident that your system is running effectively. Available in a 6 or 12 bucket system, basically the more buckets mean more yield. Both systems are identical from there, these systems offer aerated fabric grow pots, allowing more oxygen to the marijuana roots and great when draining your growth. Comes with controller module to help regulate the timing of your water flow and fill pumps. Here is an affordable hydroponic weed system that doesn’t have many fancy features, it just focuses on the job of producing exceptional yields with minimal effort. Don’t underestimate the smaller size of this system, it works like a well-oiled machine at getting the root system of your weed all the nutrients they need to thrive. 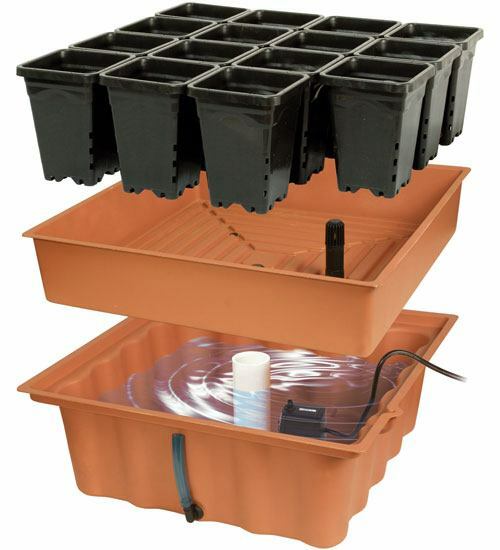 This low-cost hydroponic system features a hydroponic garden system with 15 plastic growing pots, fired-clay/pebble growth media, a 7-gallon reservoir, a water level indicator, submersible pump with a timer for automatic drain and flood irrigation. The system also includes a pH test, nutrients, and seed starter cubes. Not your flashy pot system, more of a down-and-dirty compact irrigation system at its finest. 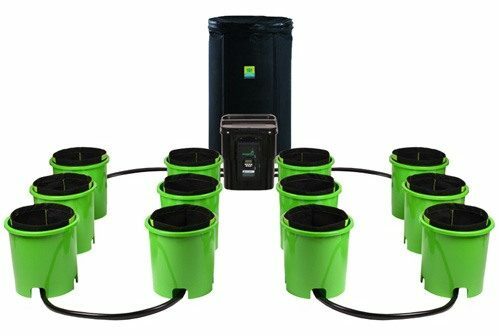 This serious looking hydroponic system will help you to achieve great results with your marijuana plants, and when you are ready to expand, you can upgrade to a larger system available in a number of sizes. This hydroponic weed system includes everything you will need to get your growing production off the ground. 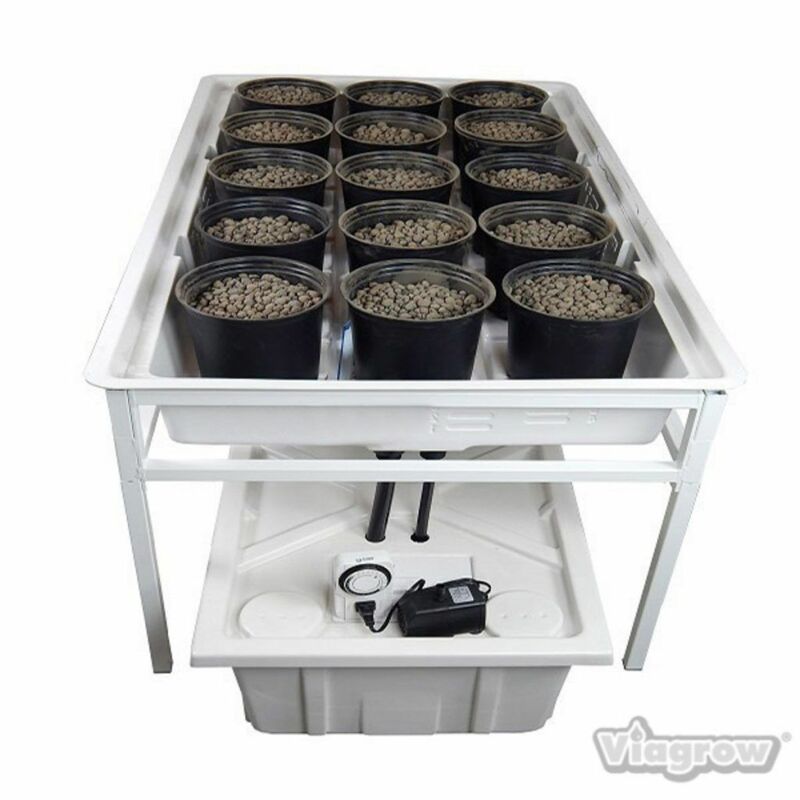 Now you have the ability to grow 10 plants in the smallest of space with the least amount of work. 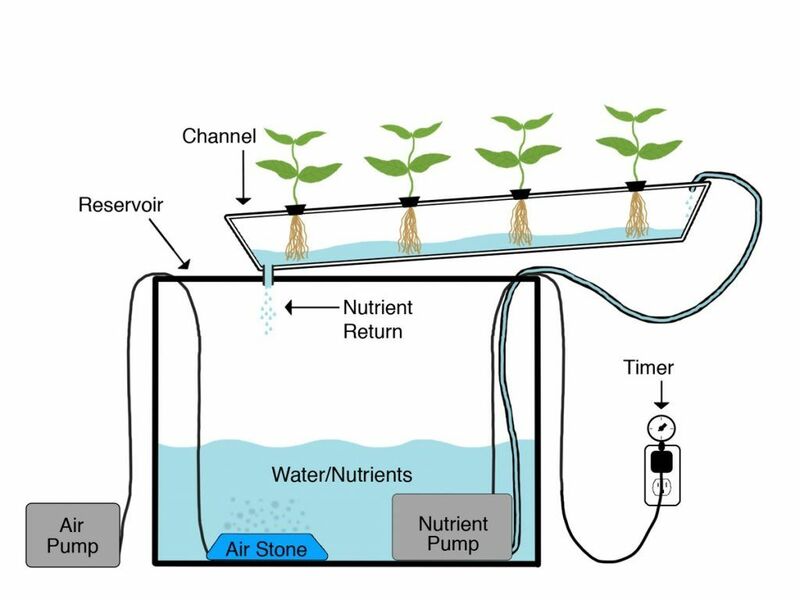 The system comes complete with grow rock, submersible pump, tubing, nursery pots, timer, 20-gallon reservoir, and tray stand. Now that you know all about how the hydroponic weed systems work, we need to compare them to the aeroponic system in order for you to understand the true benefits of the weed growing system. 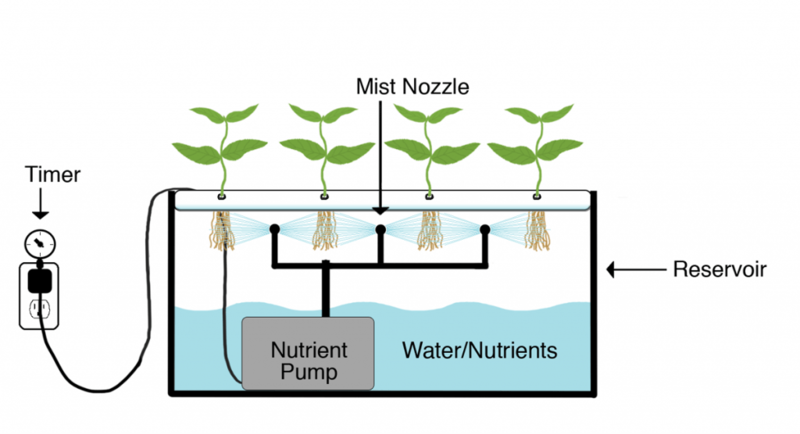 With the aeroponic system, it is more of a misting system. If you have even taken the time to ride “Living with the Land” at EPCOT in Disney World, then you have seen both growing systems in operation. The ones that utilize the aeroponic system are plants hanging in the air that are navigated past a misting system that sprays water and nutrients right on the roots. As the roots pass by, they get a misting of the exact amount of nutrients they need to produce the largest possible plants. Aeroponics and the misting system can produce amazing crop yields, requiring less time, less effort, and less expertise. Most of the aeroponic set-up systems are dependent however on the environment that maintains approximately a 100 percent humidity level all the time. Plants are first sprouted and then hung in soilless baskets with rockwool and as the roots grow, they hang downwards where nutrients are misted directly onto those roots. This does require a separate spraying system set up and timed. The key to the aeroponic system working is everything below the stalk needs to be in a sealed environment where the nutrients are misting directly to the roots. That being said, creating this artificial environment for your marijuana plants can be especially problematic for the beginner growers. Other problems begin to surface when the rooting system grows to rapidly and begins crowding out those smaller roots looking for nutrients. This uneven distribution of the nutrients often results in sporadic crop growth. Additionally, these systems can break easily and they are not cheap even at the beginner level. When trouble arises, you must open the entire system to address the concern which puts your plants at risk of drying out. Disney can afford all the pitfalls that come with the aeroponic growing system and make it up in the end with tremendous yields that they turn around and sell in their restaurants for incredible prices. For the small weed grower looking to make enough stash for personal use, the aeroponic system can be a bit of overkill and one mistake will set you back plenty of money, time, and product. Now you should have a better understanding of how the hydroponic weed systems work and why they are so beneficial towards your growing of your marijuana. These weed growing systems are small enough for the beginner grower to get a real feel for the process, and the bountiful yields will pay off in better quality buds with less work and damaged crops throughout the year. The added effort in time that you need to incorporate into the growing process to keep the root system getting the right amount of nutrients pales in comparison to the bigger and bountiful growth you can expect during the year. No more loss to contamination from tainted soil, no more destruction from pests in the soil, you control the growing process at the roots. Whether you are a seasoned 420 weed smoker or still wet behind the ears, the hydroponic weed growing process does take a time to master. Luckily the hydroponic kits we discussed earlier are affordable and allow for a wide learning curve. As you get more comfortable with the process, you can increase production and ramp up your system. In the end, your weed will be better quality, your time will be well spent, and you will be in complete control of the quality of your next big hit off the pipe.